This summer, spice up your burgers, ribs and hot dogs with homemade condiments. They will add unexpected flavor to all of your grilled favorites. Try some of tangy and sweet recipes (below). They’re surprisingly simple to prepare. 1. Combine all the ingredients in a large pot. Bring to a boil, then reduce heat and simmer for 30 minutes. 2. Remove bay leaf and cool for 20 minutes. 3. Blend the sauce until desired consistency is reached. 1. Combine all the ingredients in a medium pot. Bring mixture to a simmer. 2. Remove from heat and blend all ingredients until smooth. 3. Simmer for an additional 10 minutes. Chill and enjoy! 2. Remove from heat and blend ingredients until smooth. 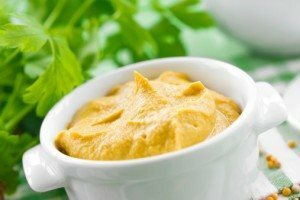 For more condiment inspiration, go to: http://www.saveur.com/gallery/Homemade-Condiments, http://www.epicurious.com/recipesmenus/slideshows/homemade-condiments-54381, or http://www.foodandwine.com/articles/easy-homemade-condiments.